Without any major snow storms and some very warm days, February turned out to be a decent month for riding a bicycle in the DMV. I managed to pound out 657.5 miles, a little over 23 miles per day. That’s 101 more miles than in January when my lungs were still messed up with pulmonary embolisms. I rode all four of my bikes, but 549.5 miles were ridden on my Cross Check, which passed 8,000 miles on the odometer. I rode only 57 miles in the basement. Up hill both ways. My longest ride was 50 miles and it was preceded by a 48.5 mile day. Not too shabby. I got back to going to the gym and lifted weights two to three times per week. My left shoulder has been screwed up for month so I added trips to the physical therapist twice a week. The shoulder starting to come around but I can’t really say the therapy should get credit. I stopped doing some weight lifting exercises that put stress on my shoulders and this has allowed the nerves to calm down. I pierced the 1,000 mile mark, reaching 1,204 as of the end of the month. If you asked me two months ago if I would have half this many miles under my belt, I’d have thought you were crazy. What’s even more surprising to me is how I am gaining strength on the bike daily. I go up hills without the gawdawful panting and wheezing of last summer. I started getting up before dawn to ride to Friday Coffee Club when it moved back to its original location at Swings House of Caffeine at 17th and G Streets NW. On my last visit, I had another run in with Secret Service police who seem to think I am an evil doer. It must have been the desperate look of caffeine deprivation. Maybe I’ll start carrying a white flag. I had lunch today with some folks, one of whom, Marie, is doing a bike tour with her husband Roy starting next week. (You can follow their exploits on their blog.) They will ride north from Jacksonville Florida to as close to DC as they can get in three weeks. She and her husband rode cross country last summer. Just talking to her has turned my mind toward “the big one” this summer. Once the weather breaks I’ll be in full planning frenzy mode. In the meantime I will be focusing on car-related activities. My wife’s car needs to pass inspection. The sticker cost $35. The repairs to get it to pass the inspection will be close to $2,000. I also need to get my driver’s license renewed. This seems kind of stupid since I’ll be on a bike for 2 1/2 months, but TSA won’t let me come home without one. Today I got up early, left the newspaper on the kitchen table, and rode to a bike advocacy event. When I got to the venue, no one was there. I checked my e-mail. The event is next Saturday. I felt stupid but I didn’t much mind. With snow and rain in the afternoon weather forecast, I might not have ridden outside today but for my calendar screw up. It was my first time on Little Nellie in many weeks so I took it easy riding to the venue. The bike seemed to be resisting me the whole way. After realizing my mistake, I took a round about route back toward home. Since the chain was moving sloppily over the sprockets on the cassette I decided to swing by my local bike shop on the way home to have it checked out. The mechanic put the bike on a repair stand facing away from me. As he checked the chain, the rear wheel turned. It wobbled from side to side. The rim was probably contacting the brake pad with every revolution. Aha! The mechanic said my chain was long gone. My bike needs a new chain, a new cassette, a new large chain ring, and a rear hub overhaul. The cassette and rear hub on this bike are of an unusual design that allows for a higher top gear. I don’t recall why I ordered this special hub and gear combination as I rarely use such high gears on this or any other bike. The special design also means that, in order to remover or install a cassette, a special tool is needed. And many bike shops don’t have one. Now that the wheel has 19,000 miles on it, I figure it would be a good time to replace the wheel with a conventional hub and cassette. This will give me a lower low gear and a lower top gear. Since the conventional cassette costs about $50 less, I will finance, in a sense, part of the new wheel’s cost by saving money on the new cassette and forgoing the overhaul on the rear hub. So despite my scheduling snafu, I managed to beat the storm and diagnose some bike problems. Today’s ride goes in the books as a productive failure. One of my favorite things about bicycling in DC is the weekly get together called Friday Coffee Club. Bike commuters would congregate Swings Coffee Roasters at 17th and G Streets NW, across from the Old Executive Office Building, to vent about their workweek, dream of weekend bike adventures, and ponder the magnificence of coffee and fritters. Many friendships were made. Remarkably, even by me. Then tragedy struck. The building that housed our coffee house was renovated down to the studs. Swings closed. Panic! The coffee club relocated across town near K and 4th Streets NW at A Baked Joint. Despite its fine coffee and yummy breakfast sandwiches, A Baked Joint lacked the three most important things about coffee clubs: location, location, location. (Admit it, you thought I was going to say fritters, fritters, fritters, didn’t you?) Many of the original club participants, including me, stopped going. This week Swings re-opened. Felkerino, one of the founding members, put out the call via social media. And the old gang re-assembled. Ricky, true to form, arrived first. Mary and Brian, two of the other founding members, were there as were many unfounding folks. Kristen gets bonus points for making a special telework-day trip to the gathering to represent the K (Kristin, Katie, Kate, etc.) sisters. Bob (Don’t Call Me Rachel) Cannon bemoaned the absence of Rachel (Don’t Call Me Bob) Cannon. This brought to mind how truly amazing it is how much they look alike. This was the crowd when I showed up at about 7:50. It nearly doubled in size before work called people away. Unfortunately, Swings does not yet have fritters for sale. (Oh, the humanity!) Andrea and I improvised by buying over-sized chocolate chip cookies. We touched our cookies together in a celebratory toast of sorts. The place looks almost exactly as before the renovation. Why mess with a good thing, right? It was actually warm enough to sit outside but the outdoor furniture is not yet in place. So we gathered indoors and conversation flowed around the tall tables. There were so many people that I didn’t get a chance to talk to half of them. Even so, I learned about federal budget injustices and self-administering injections of blood thinner and notice-and-comment proceedings and bike swaps and optimal application of man-made snow, among other things. After the gang dispersed to make their fortunes in the land of the paper pushers, I rode back to the retirement home. I stopped at the gym and lifted some weights. After that I swung by the local bike shop to have the chain on my Cross Check evaluated for wear. It’s only my second chain on this bike. I thought it would be a good idea to check it since the odometer crossed 8,000 miles on the way home. It was a fitting coda to a joyful morning. Wetlands never disappoint. Dyke Marsh along the Potomac looks different every day. Sometimes it is a field of tall grass with great blue herons and snowy egrets among the reeds. Red winged blackbirds sing their distinctive song as they cling to the stalks. Other times it is a mud flat with no animals at all to be seen. In winter ice adds to the scene on the coldest days. These changes can happen over the course of a single day. Huntley Meadows Park is a nature preserve about two or three miles from Dyke Marsh in Hybla Valley. It acts as a massive filter for all the homes and motor vehicles that climb the hills around it. Unlike Dyke Marsh this wetlands changes over longer periods. A few years ago, park managers decided to let the park go, to let nature do its thing unimpeded. Beavers began constructing dams and now the water level which used to come and go with the rain and snow. After a day of appointments, I was not in the mood for a bike ride so I took a three mile walk in Huntley Meadows. There was no foliage on the trees. The park was all grays and browns amid overcast skies. The path into the park leads to a boardwalk over the swamp. The water level was as high as I have even seen it thanks to the beavers. Canada Geese were holding a get together next to the boardwalk. Dozens of them sticking their beaks in the mud to get the roots of the swamp grass. As I proceeded along the boardwalk it became clear what “like grass through a goose” means. Footing was rather messy as the geese had gone for a stroll along the boards. A few mallards and what looked like a pair of hooded mergansers darted away as I walked along. It is too cold to see turtles and amphibians yet. Better that the sights were the sounds. Mostly there were none. The faint rumble of a passenger jet or motorcycle gave way to quiet. The dams had allowed water to build and build into the woods where the boardwalk gives way to a groomed path. If you want to use the dirt service road you’ll need a pontoon. After a second loop through the swamp I head back to the car. I thought about being a kid running through the swampy woods near home. All that remained of our local wetland was Dead Man’s Pond where we made rafts out of felled tree trunks on summer days. Here we are on a raining February weekend and I am contemplating something that is lacking from my bike riding. Purpose. Over the years I became accustomed to having reasons to bike. My bike commute was the anchor of my riding life. For an average of four times a week, I would pedal the 29-mile round trip along the Potomac River on the Mount Vernon Trail to work. 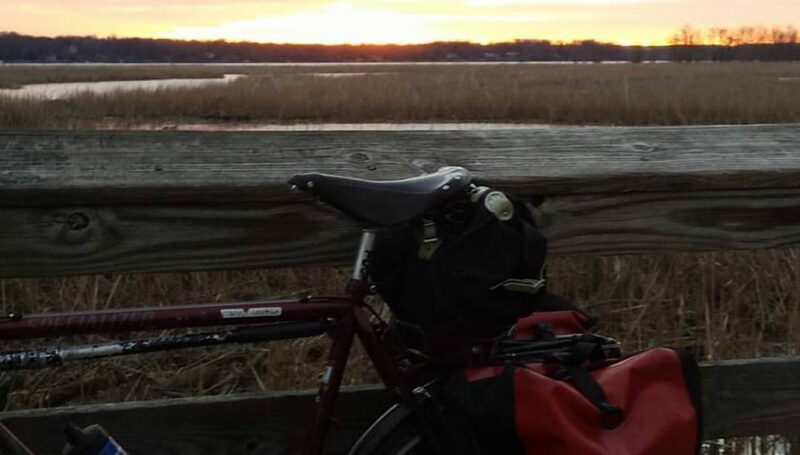 I was acutely aware of how fortunate I was to see the sun rise over Dyke Marsh, the planes taking and landing over the the trail, the boats bobbing in their slips at the marina at Daingerfield Island, birds and other wildlife going about their day, the sunlight falling on the monuments across the river in DC, and the occasional wave of fellow bike commuters as they passed going the other way. The improvised commutes involving taking one of our cars to mechanics in North Arlington. I’d drive to the garage and ride the six miles to and from the office. Picnics in the Park: A friend of mine used to invite me to hang out in Meridian Hill Park in DC. At about 16 miles from my house, it was the perfect place to go to and sit on a blanket and watch the improvised amateur circus of slack liners and hula hoopers and acroyoga-ists. My friend would always invite a mix of eclectic and eccentric people to keep conversation going. The rides home at sunset made the day complete. Rides to baseball games at Nationals Park. What could be better than to ride 16 miles to the ballpark, take in a game while sitting in the sun, then riding home either in the cool of the evening or late at night as the moon reflects off the river? Parking at the bike valet often means surprise encounters with friends. Friday Coffee Club was always a go-to for me when I was working. Getting up 15 minutes earlier wasn’t much of a sacrifice for socializing. Construction caused the location to move to the eastern side of downtown, a location that never did float my boat. Happy hours are always a good excuse for a bike ride. Third Thursday happy hour would involved a diversion of only a few miles from my commute. With the exception of errandonneuring, I have lost many of the reasons to ride every day. I don’t work so I think riding to the office would be regarded as rather pathetic by my former employer. It’s not baseball season so riding to the ballpark would be fruitless. Being on blood thinners means I can’t drink so riding to a happy hours is sad. My friend who used to invite me to picnics moved out of Meridian Hill Park’s neighborhood. Some of these losses are temporary, of course. And I suppose my desultory biking life will be at an end when warm air returns. For one thing, I haven’t done any bike overnights, out-and-back rides to a nearby destination such as Harpers Ferry. Or perhaps The Mule and I will travel further afield for an additional day or two. And weekday trips to museums will involve two wheels rather than Metro. There is hope.